Mmm, sweet honey. Creative Commons Attribution-NonCommercial-ShareAlike image by Hillary Stein. Have you ever wondered why some foods need refrigeration and tend to go off after several days, even when in your fridge, while some other foods can sit happily in a cupboard or pantry at room temperature for months or years and not suffer the same fate? There's dry stuff like flour and chick peas, but I'm thinking in particular, things with lots of moisture and sugar, such as jams, marmalades, and honey, which you might imagine would make perfect environments for moulds and bacteria to grow in. As it happens, sweet sticky things like this are perfectly fine being stored at room temperature for ages and ages. And the reason has to do with thermodynamics. Specifically, that tricky beast (and subject of Muse's most recent album), the second law of thermodynamics. One law of thermodynamics down - that was easy! Temperature measured by a thermometer. Creative Commons Attribution-NonCommercial-ShareAlike image by Leo Reynolds. Actually, before we move on to the second law, there's also a "zeroth law of thermodynamics", so called not because thermodynamics was invented by computer scientists, but because it was formulated after the first and second laws, but is more fundamental and really should come before them. It was overlooked at the time because it's so fundamental that it was generally assumed to go without saying. Here it is: "Temperature measures how hot something is." Okay, that's a paraphrase, but it's essentially what the zeroth law means. What the zeroth law actually says is that if two objects are in thermal equilibrium with each other (i.e. heat is not flowing from one to the other, cooling the first object while heating the second), and a third object is in thermal equilibrium with one of them, then it's also in thermal equilibrium with the other one. Although this is stated in terms of "thermal equilibrium", what it effectively means is that there is in fact a physical quantity (which we call temperature) that can be used as a consistent measure of how hot something is. As I said, this sounds kind of fundamental (or "obvious") - of course there's this thing which we call temperature that measures how hot something is! Nevertheless, it could conceivably have been otherwise: that if two objects are in thermal equilibrium (no heat is flowing between them), then one might be "hotter" than the other. That this is not the case is the zeroth law. Right, that's two laws of thermodynamics down. Now we get to the tricky one. The second law of thermodynamics says that there is a quantity, which we call entropy, which can never decrease in an isolated system. It can only stay the same or increase. What is this thing called entropy? Messy kitchen, high entropy. Creative Commons Attribution-NonCommercial-ShareAlike image by Curtis Perry. Entropy is related to the amount of disorder, or randomness, in a system. To give an analogy, consider your home. When everything is neat and tidy, all the dishes clean and stacked neatly inside the cupboards, all the laundry washed, ironed, folded, and in closets and wardrobes, everything dusted and sparkling, everything stored in the one place where it is supposed to be stored, then the amount of disorder and randomness is very small. So the "entropy" (using scare quotes because this is only an analogy to entropy, it's not actual entropy) is very small. When things are messy, dirty dishes piled in the sink, laundry scattered over the floor, food crumbs and dust over everything, half-read books left sitting around, piles of unread mail, and so on, then the amount of disorder and randomness is high. So the "entropy" is high. The analogy continues to another level, mimicking the second law of thermodynamics. 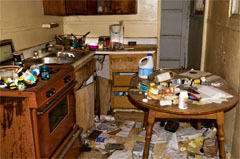 If you don't do anything about it, the level of messiness, and hence disorder, in your home tends to increase over time. It stays the same or increases, but it doesn't go down by itself. Dirty dishes and laundry pile up, things get dusty and dirty, the place generally gets messier. In other words, the "entropy" naturally increases. You can decrease the entropy (i.e. get the place tidy), but only if you put in some effort. In other words, you can reduce the entropy by expending energy. This analogy is not perfect: the dishes and laundry don't actually get dirty completely of their own accord. 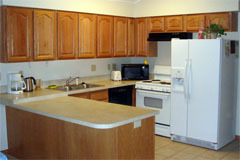 You expend energy in making meals and putting your clothes on and off. It's more the feel I'm going for here: things get dirty and messy seemingly without any real effort, but it takes conscious hard work to make things clean and tidy. Tidy kitchen, low entropy. Creative Commons Attribution-NonCommercial-ShareAlike image by David Hepworth. Given that caveat, let's extend the analogy a step further. Think about when everything is cleaned and tidied away and the house is spotless (or imagine it, anyway). Every dish is stacked neatly in the cupboard. Every spoon is in the spoon slot of your cutlery drawer, every fork in the fork slot, every knife in the knife slot. Every sock you own is clean, paired with its matching sock, and folded together in a neat bundle in your sock drawer. Every shirt is ironed and hanging neatly. Basically, everything is in the correct place. And there really are very few correct places. A spoon can only be in the spoon slot, not in the knife or fork slot. A sock can only be paired up and folded neatly in the sock drawer, it can't be hanging off the end of the bed. A shirt can only be hanging in the wardrobe. Maybe the exact ordering of your shirts doesn't matter to you, so the red one could be hung in front of the blue one or vice versa, but they're both ironed and hanging on the same rack. But when the place is messy, stuff can be anywhere! A spoon can be in the fork slot, or the knife slot, or in the sink, or sitting on a dirty plate, or lying on the floor, or even in your sock drawer. All of these places are "messy" places for the spoon to be. So, if the spoon is in a random place, like a metaphorical tornado tore through and tossed all your possessions around completely randomly, it's much more likely to be in a messy spot than the one tidy spot, simply because there are so vastly many more "messy" locations. So, if things are neat and tidy (low entropy), and things get moved around at random, it's virtually guaranteed that things will get messier over time. In other words, the entropy will pretty much always increase over time. If things start very messy (high entropy), and things get moved around at random, it's virtually guaranteed that things will simply stay really messy. Your dirty spoons and socks might move around the floor, but they're not going to end up in the spoon slot and neatly folded in your sock drawer, respectively. One might occasionally, by chance, but not all of them at once. And by the time a second clean spoon randomly enters the spoon slot, the first one has probably long gone and ended up dirty and sitting in the cat litter box or something. In other words, the entropy will stay high, it won't ever go back to the low entropy tidy state. Hot and cold objects. Creative Commons Attribution-NonCommercial-ShareAlike image by Geoff McHugh. And this is the gist of the second law of thermodynamics. In terms of proper physical quantities like heat and energy (as opposed to spoons and socks), it says (among other things) that hot things tend to cool down, and cold things tend to warm up, both moving towards the ambient temperature. To change this direction of heat flow (from hot to cold), you need to supply some energy. Stick a fire under something to heat it up hotter than the surroundings, or put it inside your fridge where the electricity driving the compressor coils can move heat from the cold inside to the warmer outside. 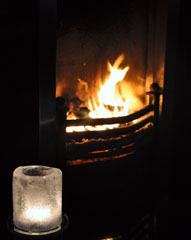 But in the absence of such external energy (take the fire away, or turn the fridge off), hot things will cool down and cold things will warm up - until they are the same temperature as their surroundings. This is such a common, everyday thing that we take it for granted. But think about it in terms of what we know about heat and energy. 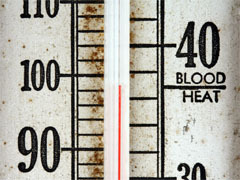 Heat is essentially the kinetic energy of atoms or molecules, vibrating or bouncing around. The faster they bounce or vibrate, the more heat energy, and the hotter the object. Take two objects at different temperatures - to make it simple let's say they're the same material, two blocks of copper. One is hot, the other cold. In the hotter one, the copper atoms are vibrating with greater energy than the colder one. If we put the blocks next to each other, the atoms along the boundary start bouncing into one another. Now, when a fast moving, energetic atom bounces into a slow-moving, less energetic one, the resulting collision transfers energy from the high-speed atom to the low-speed atom. The result is that kinetic energy tends to move from the hot block into the cold block. Now, it is possible for individual collisions between atoms to transfer energy the other way, because the atoms are not all vibrating at the same speeds. Some of the atoms in the cold block are moving faster than some of the atoms in the hot block - it's just that most of the atoms in the cold block are slower than most of the atoms in the hot block. But if a fast-moving cold-block atom hits a slower-moving hot-block atom, then the energy transferred in the collision goes from the cold block to the hot one. The thing is, this doesn't happen as often as energy transfers the other way. So the net result is heat moving from the hot block into the cold one. So, while it's theoretically possible on the atomic scale for heat to flow from a cold object into a hot one, once you consider the overall behaviour of all the atoms, the chance of this happening is vanishingly small. Now let's put this in terms of entropy. The hot block has a certain amount of entropy (or randomness), SH (S is the symbol for entropy). All the atoms in it are jiggling about with heat energy, at random speeds. The cold block also has a certain amount of entropy, SC. Put the two blocks together and—before any heat transfer happens—the total entropy is SH + SC. Now let them cool and warm respectively until they're the same temperature. The total amount of energy is exactly the same as before, but what is the total amount of entropy? It turns out the entropy is now greater than SH + SC. Why is this? 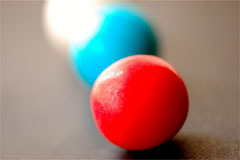 A red ball and a blue ball. Creative Commons Attribution-NonCommercial-ShareAlike image by Steve Snodgrass. Think about the atoms in the blocks. Before, there were a bazillion atoms in the hot block, moving at "high temperature" speeds. And there were a bazillion atoms (give or take a few) in the cold block, moving at relatively lower "cold temperature" speeds. (As mentioned earlier, the speeds of atoms in each block actually cover a range of speeds, and some of the cold atoms are moving faster than the hot ones, but overall the cold ones are slower than the hot ones.) After the heat transfer, we have two bazillion atoms, all moving at intermediate "room temperature" speeds. And that has a higher entropy than one bazillion hot atoms plus one bazillion cold atoms! Why? I'll use another analogy, bringing the numbers down from bazillions to just a couple. And instead of "hot" and "cold", I'll use red and blue. Imagine you have a box on your left and another box on your right. Now I give you a red ball and a blue ball. You can arrange the balls any way you like under the following condition: the left box must have a red ball in it, and the right box must have a blue ball in it. How many different ways can you do this? It seems like a silly request, because there's only one possible way to place the balls and satisfy the condition. Now instead, I give you two purple balls. You can arrange the balls any way you like under the following condition: the left box must have a purple ball in it, and the right box must have a purple ball in it. How many different ways can you do this? Suddenly you are spoilt for choice! You can stick the first purple ball in the right box and the second in the left box, or you can do it the other way around! You have two choices! Purple balls. Creative Commons Attribution-NonCommercial-ShareAlike image by Dan Phiffer. Increasing things a bit: I give you two red balls and two blue balls, and again the red balls must go in the right box and the blue balls in the left box. How many different ways can you do this? Again just one. The first red ball must go in the right box, the second red ball must go in the right box, the first blue ball must go in the left box, the second blue ball must go in the left box. Now instead I give you four purple balls, and the right box must contain two purple balls and the left box must contain two purple balls. Now you've really got some hard decisions to make. The first purple ball can go in either box, as can the second. If you've filled a box, the third and fourth balls must go in the other box, but if not then you even have a decision about where to put the third ball. 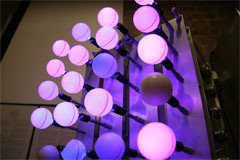 If you run the numbers, there are six different ways you can arrange the purple balls. So you see, if the atoms... sorry, I mean balls... are all the same temperature... sorry, colour... then there are more different ways to arrange them in the blocks... er, boxes... than if half the balls are hot... I mean red... and the other half are cold... blue. The red and blue balls being separated into different boxes is a "neat" state, and there's no choice about it. The red balls must be in the right box. The spoons must be in the spoon slot. If all the balls are purple then you don't care—in fact you can't care—in which box they go. If your spoons and your socks look identical, then it doesn't matter if you wear a spoon and eat with a sock. All the balls being purple is a "messy" state, because there are so many more ways in which the balls can randomly be arranged. And so it is with the atoms. Two bazillion luke-warm atoms is just randomly much more likely to happen than a bazillion hot ones and a bazillion cold ones. A hot copper block and a cold copper block is like your home all neat and tidy. Two room temperature blocks is like your home all messed up with stuff randomly scattered everywhere. It's more random, more disordered, it has a higher entropy. Osmosis. The water moves from the less salty right side to the more salty left side, despite this causing a difference in water pressure. Creative Commons Attribution-NonCommercial-ShareAlike image by Hans Hillewaert. So the second law of thermodynamics tells us that even though energy is conserved, entropy always tends to increase. Unless you apply external energy, in which case you can lower the entropy locally, but the result is that you increase the entropy around you. Supplying electricity to your fridge to lower the entropy in there comes at the cost of burning coal or harvesting energy from the sun or whatever, and the energy produced from the coal or the sun comes at the cost of increasing entropy. Now, what has this got to do with your jam and honey not going off? Imagine a thin membrane that has tiny holes in it, too small to see, but large enough to let water molecules through. Water molecules are pretty small, as molecules go, so larger atoms like chlorine and sodium (the constituents of salt) are too big to go through the tiny holes. Get a fish tank, and put this membrane down the middle, dividing the tank into two halves. Fill one half with fresh water, and the other half with sea water. Remember, the water can go through the membrane, but the salt can't. What happens? Well, consider the entropy. In the same way that a bazillion hot atoms plus a bazillion cold atoms has less entropy than two bazillion luke-warm atoms, a bazillion water molecules mixed with a jillion salt ions plus a bazillion water molecules not mixed with salt ions has less entropy than two bazillion water molecules mixed with a jillion salt ions. 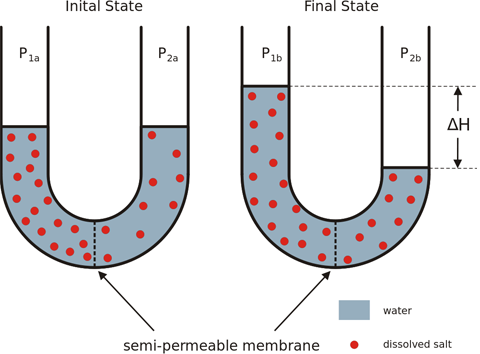 So the water molecules will tend to move to a position that increases the entropy, by moving through the membrane from the fresh side to the salty side. This actually happens, despite the fact that putting more water on one side of the membrane unbalances the amount of water and makes the water pressure on the salty side greater than on the fresh side. If you do this as an actual experiment, you'll see the salty water level rise, while the fresh water level drops. Eventually, the greater pressure on the salty side stops the water molecules moving in from the fresh side. This process is called osmosis. And it happens a lot more than you might think, because membranes that let water through and not large atoms are incredibly common. The membranes surrounding nearly all of the cells in your body, for starters. This is why drinking sea water is an incredibly bad idea. The fluids in your body have a low salt concentration, much lower than sea water. So if they're separated by a cell membrane from sea water, this almost fresh water will seep through the membrane, dehydrating the insides of your cells. Your body ends up losing enormous amounts of water, and you die of dehydration. The opposite happens to sea animals, like ocean fish, if placed in fresh water. The salt concentration in their tissues matches sea water, and so the fresh water starts moving in by osmosis. The cells swell and rupture, killing the fish very quickly. 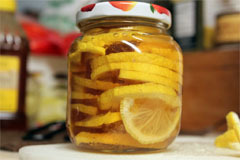 Lemons preserved in honey. Creative Commons Attribution-NonCommercial-ShareAlike image by Flickr user Heyes. And this is why salting food preserves it. Adding a lot of salt to something like raw meat draws out the moisture, not just from the meat itself, but also from the cells of any bacteria living on the meat. This kills the bacteria, and the meat does not rot. And finally, we come to jam and honey. Sugar is a large molecule, and cannot pass through cell membranes. It also forms a solution in water. And just like salt, any water will tend to move through membranes to a high concentration of sugar. You can leave your jar of honey or jam open on the kitchen bench while you make your toast. Loads of bacteria and mould spores and other nasty stuff will land in it - there are always loads of these things floating around in the air. But as soon as they hit the sugary goodness of the jam or honey, the water in their cells oozes out and they die of dehydration. The bacteria don't have time to start digesting the sugar, the mould doesn't have time to grow, before it's all dead. So you can simply put the lid back on and put the jar in your pantry at room temperature, and the contents will not rot or go mouldy, and will be perfectly good to eat next time. 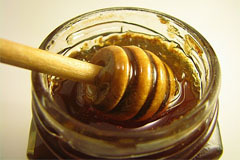 Honey is in fact such a good killer of bacteria that it has historically been used as an antiseptic dressing on wounds. It actually has some other chemical properties that assist in its antibacterial effect, making it even better than osmosis alone. 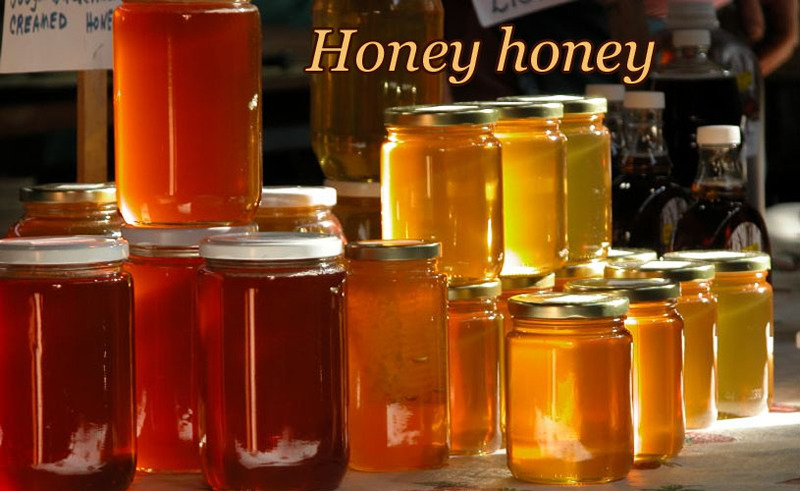 You can preserve other foods by immersing them in honey. You could possibly also preserve bodies. There is a legend that the body of Alexander the Great was preserved for several years during the long trip from his death place in Babylon back to his homeland of Macedon by immersing it in a honey-filled sarcophagus. So there you go. Next time you take out the honey jar, think about thermodynamics and entropy. Title image Creative Commons Attribution-NonCommercial image by Alexa Clark. Which you should have in your cupboard/pantry. Chick peas are cool. The complication if the objects are different materials is that the kinetic energy of the atoms also depends on their mass, so it makes talking about their speeds a bit trickier. I use the fake number "bazillion" to indicate a really big number. It doesn't matter exactly how big it is, just that it's big, and has some specific value that is the same whenever I say "bazillion". The current version of Alexander's Wikipedia page states this legend as a fact, but some quick Internet research of my own leads me to believe there is some doubt amongst historians as to its historical veracity. Most of the web sites mentioning this information call it a legend. It's possible his body was embalmed using other techniques. Apparently, [Alexander]'s not the only ancient ruler to have been so treated. Aristobulus II, King and High Priest of Judea (66-63 BC, dead 49 BC) was poisoned by enemies and (so says history) embalmed in a tub of honey. The fun part: Someone tested to see if it was possible. The short answer: no. Medical historian Guido Majno experimented by immersing pieces of rodent meat in honey for periods of time. "Very small pieces might be preserved indefinitely. But larger pieces, deep down where the honey cannot reach, putrefaction is rampant, gas develops, and the result is a terrible waste of work [...]. They must have buried that Hasmonean [Aristobulus] in a hurry." My source for this is The Cartoon History of the Universe II by Larry Gonick p. 210. The direct quote is me quoting him quoting Majno. A quick google search brings up The Healing Hand: Man and Wound in the Ancient World, p. 139, by Majno as a possible original source. Last Modified: Monday, 6 January 2014; 23:15:06 PST.